It was back to league action for all the Lincoln Saturday League clubs with four games scheduled but the match between title contenders Birchwood United and struggling Railway Inn postponed. Of the games played, Horncastle Town Reserves visited league leaders Cherry Willingham as the only side to have been their opponents in league action this season. This meant they were looking to secure their first league double of the season and maintain an unbeaten home record, while Cherry were after maintaining an unbeaten away record. Having failed to score for the first occasion two games previously, Cherry again failed to score as Horncastle ran out 2-0 winners. Nadir Boulaid and Mike Harness scored their goals with Nadir’s being his first for the team. Victory took Horncastle on to the same points as Cherry but with a slightly inferior goal difference. This result meant that second placed Fulbeck United could go top should they overcome Ruston Sports. These two sides were meeting for the first occasion this season. Fulbeck, like Horncastle, were looking to maintain an unbeaten home record while Rustons were seeking to end a run of back to back defeats. With goals from Paul Crampton (his eighth of the season), Callum Clay (his 10th) and Mark Dunn (his first for the club), Fulbeck won 3-1. Scott Robinson was Rustons’ scorer with his first for the team. 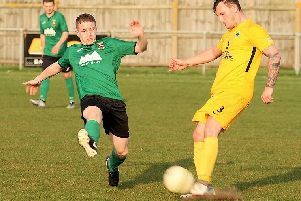 Victory for the villagers took them to the head of the table by one point from Cherry and Horncastle with Birchwood United fourth, three points behind Fulbeck but with two games in hand. Come the end of the season, Fulbeck could be rueing the deduction of three points at the start of the season. The final game brought together Retford Town and AFC Crown and Arrows. The home side were in their worst run of the campaign, having lost their previous five games, while the visitors were in their best run having won three in a row. Keeping a clean sheet for the first occasion since the opening match of the season, Retford won 1-0 with a James Wood goal. Victory took Retford one place up the table to sixth, on the same points as Crown and Arrows and Rustons. Fixtures (2pm kick-off): Fulbeck Utd v Birchwood United, Horncastle Town Reserves v Saxilby Athletic, Railway Inn v Retford Town, Ruston Sports v AFC Crown & Arrows.